(JTA) — A camp affiliated with the Conservative movement apologized after flying a Palestinian flag “as a sign of friendship and acceptance” to visiting Palestinian Muslim and Christian students. Camp Solomon Schechter in Washington State last week hosted members of Kids 4 Peace, including Christian and Muslim Palestinian children. In the letter of apology sent Sunday and posted on the camp’s Facebook page, the camp indicated that the Kids 4 Peace group requested the raising of a Palestinian flag, alongside the U.S., Canadian and Israeli flags that are raised daily. 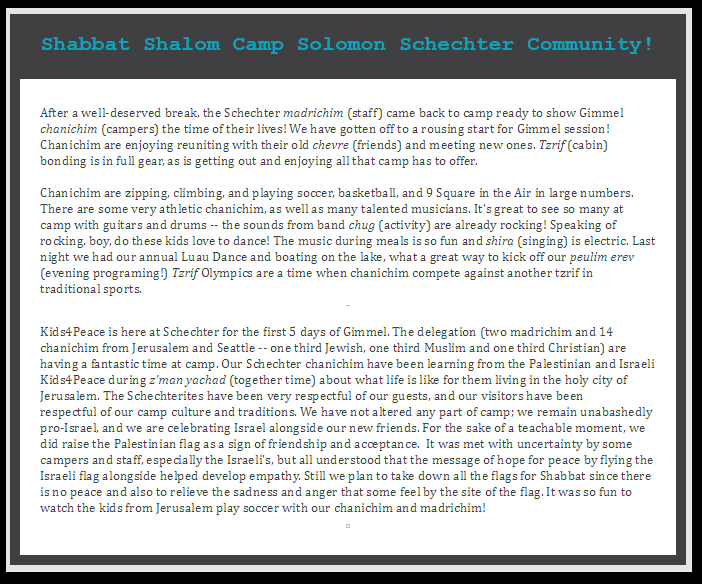 This story "WA State Jewish Camp Sorry For Raising Palestinian Flag" was written by JTA.